Summer is coming and the kids will be looking for things to keep them busy. This is a guide about keeping kids entertained during summer break. My husband and I have to work out entertainment on a very tight budget. I have two little boys, age 5 and 3. When my boys get the stir crazies, we take a walk to the closest park in the neighborhood. On the way, we use it as a learning experience. We look for special shapes, colors, textures, etc. There are endless possibilities to this game that we play on the way to the park. We play for a while and then we walk a different route home. This is one of many different ways we get rid of the stir crazy boys. I hope this suggestion helps a lot. We save lots of money by doing it and they also get a learning experience as well. I have raised 4 girls plus provided day care for many children for several years. Now I take care of a 2 year-old and a 6 year-old granddaughter during school breaks. Frugal living is nothing new to us as I was raised in a family of 11 kids and many foster children. We may have struggled because money was tight, but we never seemed to lack for fun things to do and there was always something going on that held our attention. We plant mobile gardens that the kids are responsible for. In an unusable wheelbarrow we plant beans or tomato plants. In an old rusted Radio Flyer wagon we planted onion sets. Be sure to either put holes in the unusable garden containers or put a layer of pebbles in the bottom under the soil/potting mixture to allow for drainage or the plant roots will rot and cause kid's tears when their garden doesn't grow well. We also plant lettuce (and keep re-planting all summer long) in flower pots. To lure in butterflies, we broadcast flower seeds in several "lawn" areas. This also saves on mowing - less gas and a great place to watch butterflies and catch grasshoppers and frogs. We enjoy days of "teddy bear or dolly" picnics. Make a picnic lunch and kids take teddy bear or dolly to it. You can do this weekly - kids love it! Bubbles! Dollar stores have large bottles of the bubbles or you can make your own. And you can have lots of fun and exercise chasing them! 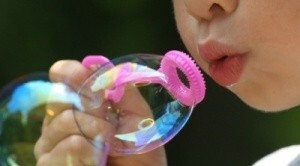 I find it is lots of fun to blow bubbles when the wind is blowing just a bit - I can just hold the bubble wand up and the wind does the work! Go to your local library once every week or two and get as many books on nature: trees, flowers, insects, backyard treasures as you can then look for those items in your yard. Maybe even start a scrapbook with those treasures. You should also pick up several books (that the kids help choose) and read, read, READ! Some libraries also have a story-time or other activity that is free and fun that will inspire any age. Let the kids work on a treasure box for their finds. You can pick up empty shoe boxes next time you go to/past a shoe store - they give away free. Let the kids spend one day decorating them with crayons, markers, stickers etc. Then they can begin filling them with treasures they find. We know people in nursing homes - find out what day/time the home will allow kids to visit and allow the kids to do that. Not only will it brighten the nursing home residents day, but the kids will most likely gain an appreciation for the elder humor. Sorry this is long - I have a lot more ideas on vacation fun on little or no money, so will hope to post more as time permits. Have fun! Every year before the last day of school, I obtain a copy of the coming year curriculum. I evaluate it and note any summer activities that will help my kids gain a healthy headstart. If your kids are wanting something fun to do this summer, have them start their own paper. They can interview the neighbors that they know, and write stories about their own life. Research shows many kids "slide" up to 30% during the summer months. Don't let that happen to you. Get free movies to watch from local library. This is especially great for kids over the summer. Make one day a week a movie day. Family activities don't have to be elaborate or costly to be enjoyable. Often the simplest activities are the ones kids enjoy the most. We've taken our kids to Walt Disney World and a host of other extravagant vacations, but the things they seem to enjoy the most are going on picnics and having family game night. To keep kids entertained, look for free events. Sometimes programs offer 1 free class with no obligation. Gymboree, Little Gym, and Stroller Strides do this. Additionally, some churches have open play times for a minimal fee. Kids get bored during the summer and taking them places can get expensive. Try doing a craft project once a week. Something easy and cheap. Are you looking for a way to have fun with your kids right at home? Then consider having a jungle day in the backyard. There are many things that can be done in the backyard to turn it into a pretend jungle. Water balloon fights are always a big hit at summer kids parties, but the burst balloons all over the ground are a hazard to wildlife and curious toddlers. Encourage kids to clean up by offering a prize for the one who picks up the most bits of rubber balloon. In the summer the kids need things to do for fun and learning. It's a good time to broaden their education, especially outdoors. Here are some links of sites with indoor and outdoor activities for children. Summer brings mixed feelings. Usually the first week is fun but after a few days we hear the familiar refrain, "Mom, I'm bored, what can I do?" During summer vacation kids need to rest, as well as, keep busy. So many parents are concerned about making their kids have a productive summer that they forget that summer is also a time to sit back and relax. What can my grandson do to beat boredom this summer? He is 11 and is driving me crazy! I keep him in the daytime while his parents work. I won't let him play on the computer and he's tired of his Playstation games. (I refuse to buy him any more). Does anyone have any ideas? There aren't many kids his age that live close by for him to play with. Any ideas? He will balk at any idea at first. Just be patient and keep trying. If he finds some type of bug or insect, go to the library and look it up. Have him earn "computer bucks". Instead of making play money, you could use old monopoly money. Make each dollar worth so many minutes of computer time. Have him do some of the suggestions for a while and then he can earn an equal amount of supervised computer time. It's been a while since I had kids that age. But I do have six grandchildren. My daughter uses the computer bucks and not only for playing games. Her children love going to the library etc. I certainly hope this helps. I would recommend The American Boy's Handy Book or The Dangerous Book for Boys (links below). They have lots of outdoorsy and other really interesting activities. Is he a Boy Scout? Get him working on those merit badges! Also you could think about volunteering somewhere with him. Help him to find ways to use his time productively, not just to pass the time. Help him to learn a new skill or hobby that he can show for his time. Good luck! There are usually stores around where he can swap his Playstation games. He might try getting new games that way. Sometimes having a friend over is not really more work, but less work as they keep each other entertained. He can then play basketball, baseball, or ride bikes, etc. It is vitally important in the development of boys to be forced to find their own amusement. My parents did me a great favor by kicking me out of the house, saying it's a crime to sit inside during nice weather, and boredom turned out to be very wonderful in that it made me notice my world. I went for rambles, I found new friends, I made things from the natural materials (I remember a placemat made of grass stems). Boot him out and tell him not to come back for four hours, and give him a watch to come home on time. When you want to call him in from around the neighborhood, toot your car horn a predetermined code. Introduce yourselves to your neighbors so they can see him and recognize him. Buy him active toys like a frisbee or a dog or a chunk of rope. Let his imagination get some exercise! This boredom is his imagination crying for a chance to come out and play. Enjoy him at this age, they ask some great questions! Oh to be a kid again and have the whole day to play! What sweetness! Sure he will be pleased if you want to play something with him and that's fine for some times but of course you have your own things to do too. I dont recall ever being bored as a kid. If we ever complained Mom would say 'well if youre bored you can always go to the garden and hoe" It didnt take us long to find something that would make us happier. Of course we lived in the country and I played for so many hours all by myself. Never got lonely. And my Mom just wasnt a lot of fun anyway. I would think any kid could find a million things to explore. Even in the city. And at home or at least in the neighborhood. I dont know where you live. Some activity books like Annaid suggests. Or ask him to go out and study something. You pick or he picks. And ask him to find 20 things he can say about it. Or as many things as he can find. I could spend hours watching a spider even. Show him how amazing his world is if he begins to look at it. Discovery is such a wonderful thing for humans and especially kids. This is such a precious time for him, if only he can discover that. Many of us would kill to have the whole day to play just as we choose. All kids are incredibly creative with even the simplest of materials. Let him find out, expand his mind, his world. What a lucky young man. Go to the library. Look for books to read or books that show you how to make stuff. I think there are books that show you how to make things with duct tape--he might like that. Volunteer at an animal shelter or soup kitchen together. Go to garage sales on Fridays. Let him have some friends over. Teach him how to cook a simple meal, then he can make it for his parents later that week. A lot of learning can happen on a computer, especially with the internet. I don't understand why his parents let him play video games but not use a computer. If it's inappropriate content they're worried about, there are filters available to help avoid that stuff. I used a computer program called Mavis Beacon Teaches Typing to learn to type when I was about that age and that ability served me well through high school, college, and now as a teacher. Volunteer at local hospital or nursing home, etc. I'm a 24/7 Caregiver, Home School Teacher for my 9 yr. old grandson, for 6 1/2 yrs. now. He has finally met a 11 yr. old boy in the neighborhood with whom he really gets along and is available to be good friends. Their favorite thing to do is swim, make shaved-ice (Targets for under $20, good for parents ot buy him and leave at your house. )Using fruit juice/kool-aid for flavorings. this and are very alert to strangers. I don't encourage bike riding, for safety's sake., but using a small "sidewalk wooden bike ramp" to drive over saves the day. Once I took them to toss the baseball, but not often. and KOL (Kids on line) are o.k.because they are SAFE. strict rules before letting him "visit" on their KIDS' chat rooms. renting videos from the Library. I've discovered a wide range of fun-LEARNING videos as well there. a month, ONLY if a G or PG rated movie that I accept is playing. Oter times we go to the local skating rink, if his dad gives us money to do these extra things. to get ice cream/sorbets/yogurt/OR $dollar burgers, all within 2-5 miles of home. has pets but doesn't like to take better care of them, since it's daily. seem to like exercise equipment and light weight-lifting. I have a good library but encourage this more during the Fall and Winter than Summer. It's also a time when they like to push boundaries wtih sound effects they make, like whistling, laughing,giggling like older girls, telling/hearing funny jokes, stories, experiences, seeing funny photos, taking pictures(if you have a camera...), and reading magazines, especially for their age and interests. The big thing among them is Spider Man, and SuperMan. sale fruits. One of my rules is that I need to know why they are in the kitchen, not just leave it open to them, both to budget our food, AND to remind them to keep their little grimey hands washed before handling foods, for their sakes and mine. Occasionally I will play Monopoly, Battleship, Stratego, or other games, or take turns reading to each other, and praying twice daily. I trust that God has urged my heart, helped me to raise this child properly while his parents continue to get their lives in order. One thing I did when I was young was go house to house until I found a playmate each day. This is not only not acceptable in this neighborhood, but not during these dangerous days when even adults are being kidnapped and worse. A child needs only a couple of decent friends/playmates who meet parental and godly standards. If they have that they should consider themselves very lucky. If you open it, shut it. get it out, put it up. put it down, pick it up. can, or leave food out anywhere, whenever I do find it, you will be punished. If you simply learn to obey me, honor me by using your manners everywhere you go, and learn not to question every statement I make, and not to argue so much, we will get along fine. ____." About 25 times the first offense, double should there be a second offense. chosen not to go that weekend, like missing school because of some illness. I don't know if all I've done is correct, but I am trying my best, with the help of God's Word and Holy Spirit. Hope this helps in some way? What is a good schedule for a mother with 2 kids starting with the morning time. I feel so tired and clueless on what I have to do when I wake up and throughout the day. What can I do to keep my kids busy and entertained? What is a good schedule to keep busy? My son is 9 years old and my daughter is 7 weeks old. Keeping your school age children happy, physically active, and learning during the summer. Morning Movies for Kids - Our local theater has a kids program at 10:00 a.m. during the summer. Because of the popularity of this program, they are now offering it several times a week. The admission is very little and they have a great concessions special. Visit Your Local Library - Kids can be entertained for hours in the quiet air-conditioned venue offered by the library. See if yours has a special craft/story time program which your children might enjoy. If you don't have a computer at home, take them to the library. It's free and they'll know how to operate them. Take a Field Trip to a Nearby Park - There are many beautiful public parks that offer more than just playground equipment. Often there are nature trails with the plants/trees identified, ducks to feed (take your stale bread and leftover popcorn), places for a picnic and all for free. Many state parks have rangers there to present free informative stories about the site. Set Aside a Quiet Time Each Afternoon - Encourage them to read or rest during this time; no TV and only quiet music. Post a chart with numbered lines on it in an easily accessible place. Make a chart for each child and have them record the names of the books they read. Have them give an oral report to you and their siblings. For younger children you can make a bookworm by cutting out colorful body segments and adding the name of each book as they read it. They love to see it grow. For your non-readers, make them one with the books they have sat and listened to you read to them. Your children will be much better prepared to start school again in the fall if you continue this practice through the summer. You could also work out some kind of point system for a more tangible reward if you choose. Swimming Outings - Most children love to splash in the water. Have them run through the sprinkler when you're watering your garden or lawn. For even more fun, join them for a walk in the rain (not a thunderstorm, of course) with flip flops, clothing that it's okay to get wet, and no umbrella. They'll love to see you showing your kid side and you'll have some good laughs together. Farmer's Market or Pick-It-Yourself Farm - If possible, plant some easy to grow vegetables in your yard or in containers on the deck or patio. Potatoes are a good choice because they require little, if any, attention and digging them is like a treasure hunt. If you don't want to plant your own garden, take them to a farm where they will be allowed to pick what they will be having for dinner. Plan a Scavenger Hunt - Adjust the clues to suit the age of each child. Invite some friends over for even more fun. Find Other Parents Whom You Trust and Do an Exchange - That way you'll each have a day off to catch up on whatever you choose to spend it doing. Enjoy these days because you'll miss them when those little ones are grow and no longer need your suggestions for entertainment. Source: Years of experience as a camp counselor, teacher, a stay-at-home mother and the "Mommy who likes to." (A title given to me by my son when he was in grade school. After a couple of exhausting weeks of grade-parenting, supervising their friends who came to swim or play, transporting many whose parents couldn't, baking cookies for school parties, etc., I slipped and said something I wished I hadn't the minute it slipped out of my mouth. "Why am I always the one who...? My son replied, "Because you're the mommy who likes to." That makes it all worth it. 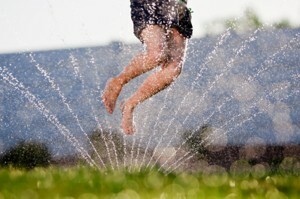 Editor's Note: Do you have a favorite frugal way to occupy your children in the summertime? Share it with us here. My kids have no schedule. None. During the school year they did, but I have been EXTREMELY lax since the summer began. I need advice on making a schedule for them for the rest of the summer. They are 9 (going to 4th grade) and 7 (going to 2nd grade). During the school year, they got up at 7:30, did their morning routine and rode the bus to school. After school, it was homework, dinner, showers, stories/snack, a little t.v. and then bed at 9. Mondays, once a month, were scout pack meetings and every week on thursday were scout den meetings. That has also let out for the summer and picks back up in September. Right now, this is pretty much their (our) schedule. They get up whenever they feel like it, usually around 9 or 10. They eat/get dressed, then we leave to pick up my mom and go to the gym. After that we hang out at my sister's for a while or at my mom's. Then we come home in time for my hubby, around 3:30. I make dinner while they play around the neighborhood with the other kids. I call them in for dinner when it's ready. (we use walkie talkies, lol) They eat dinner then go back outside to play until around 9:30, when they come in and take a shower, watch tv and hit the bed, with a movie in their room. They don't read, they don't do the expensive computer games and workbooks we bought from school to help them prepare for school. I just don't know what kind of schedule to have or where to start. Can someone help me? It sounds like they are having a good summer! Summer is meant to be relaxed and memorable. Are they having behavior problems? Did their teachers recommend extra schooling or computer games to get them ready for the next school year? I like the idea of TV Tickets. I may try using that! I am the evil step mom that stopped them from watching countless of hours of tv every day and limited them to one hour....TV Tickets makes it more of a fun game for them, while also teaching responsibility. During the first summer of being 'step-mom' I used a rigid schedule...I worked from home and they had been spoiled by grandma so much that they were unruly...they also had issues with too many video games changing their behavior, so I limited it to 30 minutes during school days and 1 hour during the summer. They woke up and had breakfast at 8 and then got ready for the day, played outside, and then I had them do worksheets till lunch time. The worksheets I printed from online and they were grade appropriate for the coming year. I helped them minimally, but it was better to have them quietly ask me questions than the run around the house being noisy while I tried to concentrate (we had a very small house). Then lunch, then they would watch some TV and play video games and then do chores. By that time I was done working and I would have them play outside or in their rooms while I made dinner...and occasionally they would help with dinner. The following year, the kids excelled at school and our 8 year old already knew all his times tables for 3rd grade before it even started. He aced his SOL's. Now that we have moved to a bigger house, the kids are more in control, and there is more space for them to roam...they are used to playing more without video games and TV as a crutch, so I have been more relaxed but I did get them in a day camp for a week, took them to VBS at church for a week, they took swimming lessons one week, and they have been going to the library twice a week with their grandma and to the pool once a week, so she still gets to spend time with them. They also have free movies on Tuesday mornings at our local theater for kids, so she will at times take them there. That way they get out of the house and have fun, but also learn and behave.